July was a whirlwind month for us. We packed in lots of swimming, camping, outdoor fun, time with family, and even a week-long family reunion in Las Vegas. Having saved money for our family reunion throughout the year, we were able to go on our trip without stressing over what things cost. I’m still frugal to the core and like to make sure I’m getting the best deal possible (not sure I’m ever going to grow out of that), but having the money earmarked specifically for our vacation made spending really stress-free. Due to all of our adventures, our grocery shopping was more haphazard than normal. I didn’t do my regular monthly grocery haul, I just made smaller trips here and there throughout the month. Thanks to a generous income last month, we were able to put a lot toward our goals, as you’ll see below. Okay, onto the numbers from July 2018! Our total income for July was $9,083. Since we live on last month’s income, this is money that we’ve been holding to start spending in August. My Income (Blog)– $1,852 After having my highest income ever last month, this month is the lowest my income has been in years. I’m not freaking out though. It’s pretty normal for blogging to be up and down with income. Of this, I’m setting aside 25% for taxes ($463) and distributing $1,389 to the family checking account as my paycheck. I use Blog Finance Spreadsheets to keep track of everything. Elite Blog Academy is the course I took back in 2014 that set me up for blogging success. Rental Income- $586 This is the amount of rent we keep after paying the utility expenses for the one-bedroom apartment on our property. Our renters got a new job out of state so we won’t have any rental income until we get new tenants. We would rather wait to find the right people than get it rented in a hurry, so it might be a few months before we have a rental income again. For a detailed explanation about our rental, check out the bottom section of March’s budget update. Each month we budget down to zero using last month’s income. This change revolutionized our budget! For more about how living on last month’s income works and how you can get started, check out my free Guide to Getting a Month Ahead Financially. Tithing– $1,899— We happily pay a 10% tithe on our total income from the previous month. You can read more about why we paid tithing, even when we were in debt. Other Giving– $100– Other charitable giving this month. If you want to know more about our house finances, you can read more about why we got a conventional mortgage (instead of FHA or USDA) and then why we didn’t wait for a 20% down payment. Electricity– $344 Our electric bill is for two households, as our renters are on the same meter. We get our bill at the beginning of the month for the electricity we used monthly in the previous month. This is one of our highest electric bills ever! On the plus side, in July we earned $54 cash with OhmConnect, just by using less power during peak times during 2-3 hours per week. We put our earnings into the kids’ fun fund (not to our family budget). If you’re in California, Toronto or Texas, you should definitely check out the OhmConnect program. I’m working on a post and video that will give you all the details. Water– $88 Our water bill comes every other month, so I just set aside approximately half of what I expect the bill to be, which is normally around $45. When our bill came in July it was $134! Yikes! That’s 50% higher than normal. I found that the kids had been leaving the water on to the lower half of our property when they fill up the chicken’s water or water our berry patch or little garden. Well, the spigot down by the chickens leaks (which is why we normally turn the lower water off at the main up at the house). Let’s hope that doesn’t happen again! (Fixing the leak is on the list of things to do, just not at the top. Turning the water off at the house has been a very doable work-around). Internet– $70 We’ve had internet at our house for a whole year now! I still remember the days of blogging from the (dis)comfort of my van (pregnant belly and all). So we’re happy to have internet at home. Sadly, we pay $20 more each month now that our first year promo is up. We could call and try to negotiate, but seeing as we have zero other options (and invested $5,000 in even having this option), we’re clearly not going anywhere else for internet. Home Phone- $4 Since my husband works at home a day or two each week, we decided to get a home phone for him to use. It’s Ooma, which is internet-based, not a traditional land line. The monthly service charge is minimal ($4) and the initial set-up (hardware, etc) was under $100. If you think Ooma might work for you, that link will also get you a $20 credit! Republic Wireless Cell Phones– $14 We’ve been using Republic Wireless as our cell phone carrier for over three years now. This covers the cost of service for my phone, including all taxes and fees. (We’re on the Republic Refund plan from a few years ago which is no longer available; an equivalent plan for a new user today would be $20/month). My husband also has a Republic phone which he uses for his private practice, but that’s a business expense, not a family budget expense. If your cell phone bill is killing you, I definitely recommend that you check out Republic Wireless! Food– $305 This year I’ve been open in sharing our grocery shopping trips with you. We didn’t do our normal monthly grocery shopping in July. It was kind of a crazy month all around. During the first week of the month we went camping. My husband planned our camping menu around what we already had and a few things we picked up on our way to the mountains. Then later in the month we headed to Vegas for a family reunion. We bought groceries that week with our vacation budget. At the end of the month my husband stopped by Sam’s Club on his way home from work and got what would normally be a Sam’s Club monthly haul except the month was nearly over. Gas– $469 Gas could have come out of our vacation budget, but with hubby not commuting to work during our camping trip or reunion, that freed up money in our gas budget, so we just took all of our gas money out of the gas budget. Our fill-up prices in small town Nevada were around $4.50 per gallon! The way we drove, though, there was no way to avoid this (we went hundreds of miles without any cities or towns. Clothing– $146 We got some necessities for my husband and me and also some school shoes that we found for a good deal at the Adidas outlet in Vegas. Household– $325 We (well, I) got a little crazy in this category in July. I’ve been thinking about getting an Instant Pot for a while now, and I decided to go ahead and do it on Amazon Prime day. This is the Instant Pot I got. I also got this Fitbit, another something I’ve been wanting for a while, on Prime Day. I’m calling it an early birthday present to myself (but categorizing it as household for some reason). We also stocked up on toilet paper, toothepaste, paper goods, and got a few other household essentials. I got a big box of disposable diapers to bring on our trips. Fun– $100 We got a family pass for a new aquarium that they are building near us. We haven’t told the kids yet. It doesn’t open until the fall. Animals– $25 We got a 44-lb bag of cat food. We are nearly finished with all of the chicken feed we stocked up on a few months ago. Allowances– $45 We recently started giving allowances for our kids. I’ll explain our system and how it’s working in an upcoming post, but if you want a sneak peek, check out the book The Opposite of Spoiled. We skipped the week we were on vacation. Now that we’re done funneling all of our extra money toward debt, we use sinking funds in our budgeting. This is money that we set aside each month into certain categories where it builds up until we need it. The amount in bold is the amount that was added to the fund this month. Any spending from the fund is noted in the comments, along with the current category balance. We do not have separate accounts for these funds. All of the money lives in our checking account. I’m not a bit worried about getting the money mixed up because we spend according to our category balances, not our checking account balance. We seriously never even look at our checking account balance unless we’re reconciling our account. We track out budget categories and spending in YNAB. Home Projects– $2,884 We added a big chunk of money to our home projects category. We have a whole list of projects we are saving for, some of which will happen in August! Right now we have $3,824 remaining in the home projects sinking fund. Dental– $30 We have $210 in dental right now. Medical– $100 We spent $11 out of pocket in July. Our current balance for medical is $691. Car Repair– $300 We spent $449 in July for some repair on the can. The check engine light came on when we were heading to the mountains for our camping trip. The current balance in our car repair fund is $327. Car Registration & Smog– $40 We currently have $224 in this fund. Christmas– $100 We currently have $700 in our Christmas fund. Gifts– $40 This is our fund for birthday and other gifts. We currently have $198 in our gifts fund and we didn’t spend any in July. College Savings– $125 We put $25 per kid into 529 accounts. More on our decision to start saving for college in this post. Vacation/Family Reunion– $0 We had a total of $709 saved in our vacation fund that we started at the beginning of the year. I figured that whatever we didn’t need for the family reunion we would save for our next trip (probably over Thanksgiving). During our family reunion, we spent $416. That includes groceries (each family took a turn cooking breakfast and dinner one day during the reunion, and we made our own lunches each day), tickets to Adventuredome indoor amusement park (I bought some 2 for 1 coupons for the park on Ebay, so it was essentially half price), and eating at a buffet. (As we were standing in line at the buffet, a sweet lady who was staying at the hotel gave our family her two free meal tickets that she wasn’t going to use, which saved us $45!). The accommodations were already taken care of with some Airbnb credit that I had. There’s one other expense that will be coming out of our vacation fund, but I’ll tell you about it next month. Right now there is $293 remaining in our vacation fund. Our savings goal for 2018 is $26,000 ($15,000 toward our emergency fund and $11,000 to my IRA). Our goal for 2018 is to reach $25,000 in our emergency fund (we started out with about $10,000 at the beginning of the year). In July we put $5,406 (and got a bit of interest), which makes the current total $25,696! Goal achieved! My husband will be writing a post to explain where we ended up deciding to keep that money (a follow-up to this post that he wrote a bit ago). In July we contributed $550 to my IRA. We automate this contribution each month so that by the end of 2018 my IRA will be maxed out. At the end of July we are at $23,250, which is 89% of our goal! So the rest of our 2018 saving goal is just to put $550 in the last 5 months ($2,750) of the year. Hopefully we will be able to save for a few more (small) house projects as well. 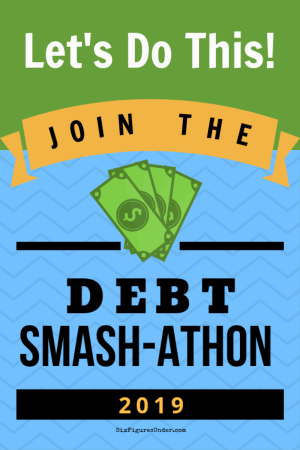 I’d love to hear about how your budget and/or debt repayment went in July! $1080 is definitely a lot for prep tax but I might need to look into something like this. I’ve been doing my own for 17 years now. It was easy the first 10 years, but It has gotten a lot more complicated in recent years with investment everywhere. You’re killing it! That’s got to feel so good to have that emergency fund totally done! We’re going for $10,000 in ours, and I already can’t wait until we’re there so I can free up some cash for investing in our retirement again. You gave me budget categories I hadn’t even thought of. First I would like to congratulate you for achieving your financial goals. But after reading your last post something else is on my mind: Home schooling seems to be very popular in the US, especially for religious reasons. As I am from Germany where home schooling is not an option, I wonder how it can be done. How do you manage to teach all the compulsory subjects on the curriculum (English, Math, Science, History, one or two foreign languages and so on) to a fifth grader? Here in Germany teachers have to take a B.A. and, for HIgh School, a M.A. with two majors and a year of teacher training in order to qualify. Normally they teach two subjects (for instance German/English, Math/Physics, Latin/History). I find highly improbable that even a qualified parent with a degree in two subjects could teach all kinds of classes at home. I have homeschooled my kids for 10 years. It doesn’t take an advanced degree. For teaching elementary school, a teaching credential is a lot about learning classroom management and about the whole range of children. To homeschool you need to know your own children and where to find reliable curriculum. My daughter has caught up with me in chemistry knowledge so we will be learning together this year. Also, many of us work through an independent study school, so there is a trained teacher to offer guidance and support. I have an M.S.Ed. I am a former university instructor who taught in the teacher education program in my field at a state-run university where I lived at the time. I am also a homeschooling Mom in my eleventh year of homeschooling. We homeschooled our oldest from third grade through high school and are currently homeschooling our younger two children (second and fourth grades). How it is possible is different for each family. There are endless possibilities for a curriculum to assist parents in teaching their children. However, you don’t have to do it alone if you don’t want to. You can sign your children up for classes in those things that you aren’t comfortable teaching yourself. You can hire a tutor. There are science centers and museums with courses for children. Depending on the state that you are in there are virtual schools. The local area may have an educational coop. There are correspondence courses. There are courses at community college and universities once the child is ready for that level of work. There are many different teaching philosophies and learning styles with endless educational opportunities for each. Education is not one size fits all. July is always my favourite month financially. Since June 30 is the end of the financial year, July sees an influx of money with tax refunds and family benefits. All of our big expenses (insurances, council rates, car registrations, etc.) come in the first half of the year, so we do the bulk of our savings in the second half of the year. Still, so far this (calendar) year we’ve saved $15,000, even after the kitchen remodel, buying a new (used) car for cash, going on two holidays, paying in full for one future holiday (it’s a cruise, so it’s all-inclusive), buying plane tickets for another ($135 return to Kuala Lumpur, a city we all love) and buying theatre tickets to Harry Potter and the Cursed Child. Oh, and the Christmas shopping is all done too. Not bad for a household income which is slightly below the median! I am learning so much from your email class. Thank you so much. I don’t know where to start regarding an emergency fund. Now that I don’t have a horrible car, I’m not constantly afraid of breakdowns. I’m getting paid tomorrow from my main job, and I’m half thinking $200 for “gas and pets” might be in order. I do have to respectfully disagree with you about tithing, though. I live in an area where there isn’t a whole lot of LDS, but a LOT of Christian mega churches that pressure their people to tithe. We also have an enormous homeless population. The churches do not want to help the homeless for the most part. They treat them as untouchables. For that reason, I’ve been against tithing (in my community), but I do not know where you live. It may be different there. I think the work you do teaching people personal finance is a very good way to be of service. Akasha, to some extent, it varies by community. I know in Salt Lake, the LDS Church does a great deal to help the homeless. (My parents used to do some homeless outreach with the LDS church, so this is something I actually know a lot about.) They have a grocery store which is only open to those in need, according the homeless, regardless of religious affiliation. People get to choose their own food and everything is free, although where possible they ask that those who receive help do a couple hours volunteer work to “pay” for the groceries. (Many welcome this because one of the worst parts of homelessness is feeling like you’re useless.) Same for clothes. They provide job support/training and real, hands-on experience, housing support, and when someone leaves the street or if they need help setting up a new home (for instance if they’ve left a violence situation) furniture and other household goods. The job training is in line with what the individual wants to do – they have job counsellors to help with this. Everything is tailored to the individual, as much as possible. It’s a pretty comprehensive service and has been recognised nationally. A few years back Mother Jones did an excellent piece on homelessness in Salt Lake and every person they spoke to credited the LDS Church. There LDS church also has an amazing humanitarian program that delivers overseas aid to some of the poorest of the poor. I’m a development geek, with an MA in International Development. The LDS programs, from what I’ve studied, seem like “best practice.” They are incredible. I want to stress that the LDS church does not function the same in every community; the services available in Salt Lake may not be available where you live. There is a wide variety of ‘interpretation’ by local authorities. Some take a more patronising view towards homelessness. Even within Salt Lake there are differences. My parents’ congregation is known for its helpfulness – so much so that when prisoners from the penitentiary are released, if they get assigned to a half-way house within the boundaries of my parents’ congregation, they call it the “golden ticket” because they know that congregation will do everything possible to get them back on their feet. My parents and their fellow congregants don’t resent this; they rejoice in it. But I think more broadly, the idea is to give what you can where you can. I’m married to a non-Mormon. At the moment I’m a SAHM. He doesn’t want to tithe to my church. But we still give. There are plenty of great organisations out there who are doing amazing work. Find one you like, whose values align with your own, and give generously. I can imagine it varies by community. I’ve never been to Salt Lake City, but where I live, there is a huge disparity between the wealth of the churches and the rest of the people. The mega church closest to me looks like a mall. I only went to Services there once. I definitely think each church can take in a homeless person or two, if not dozens. The buildings are huge and used twice a week at most. according in the first paragraph should be including – including the homeless – stupid autocorrect. Okay, I’ll shut up now! I do appreciate how Stephanie tithes because it is Biblical. Most of the homeless in our area are homeless by choice thus I do not care to help them. However, our church does help the widows and the orphans. That’s really unfair, and I wonder if you have actually spoken with homeless people and know that for a fact, or if you’re making assumptions. Homeless people are driven to that point by many factors. Often there is a combination of mental health problems, physical health problems, and substance abuse. Some homeless people “choose” it in the sense that they would rather be homeless than confirm to rules which aren’t conducive to their choices; but we all would prefer to make choices about ourselves, and why should we deny that right to the homeless? My parents used to work with one man who was homeless because he gave his benefits to his daughter. He and the daughter’s mother had divorced when she was a baby – he came back from the Vietnam war with severe and undiagnosed mental health problems – and when she was a grown-up, he wanted to make it up to his daughter. So he sent her every single check he got, which meant he had no money and had to live on the street. Sure, it’s his “choice” but that doesn’t mean he’s not worthy of help. I would suggest you educate yourself about the problem, rather than assume these are lazy, good-for-nothing bums who don’t deserve your compassion and love, just like every other child of God. Every single person my parents met had a story that made them think, There but by the grace of God . . . Where I live, the face of homelessness is changing, most new homeless are middle ages women who were previously financially secure, but through divorce and job loss have lost it all. Jesus doesn’t day we get to pick and choose who we help. He doesn’t say, Don’t help them because they aren’t important. He says, When he have done it to the least of these. Don’t pretend you can be a good Christian and ignore the homeless. Lol, thanks for proving my point. I am wondering if you use pen/paper at all, or just strictly YNAB. I am trying my best to get the hang of YNAB and forgo my paper budgeting. I tend to be all in type of person, so if I struggle with YNAB I usually call it quits and go back to my norm. just curious if it took you time, or did you just commit to sticking with it. Please please reserve a bit of your blog posts on homeschooling. I am thinking of home schooling my oldest next year but am feeling a little intimidated, mostly about the time management piece. I am so busy at home and can’t imagine finding the time to commit four hours to his education. And you have babies still so, I know you hear me on being busy at home. Good luck and let us know what you discover on the way.